Jamey Eisenberg, Dave Richard and Heath Cummings discuss Josh Gordon returning to Browns camp. Please log in or register to view your favorite teams video. Pete Prisco and Jamey Eisenberg join Nick Kostos on HQ to break down the 5-year, $95-million extension for the Giants' star that makes him the NFL's highest-paid wide receiver. Dave Biddle of 247Sports joins HQ live from Ohio State to discuss Urban Meyer's suspension. Why should owners not panic about Andrew Luck's struggles vs the Ravens? Can Adrian Peterson make an impact on Redskins? What effect will Adrian Peterson have with the Redskins? Bryant McFadden discusses Gordon's return to the Browns and what to expect from the WR this season. Bryant McFadden breaks down Sherman's comments on the controversial new helmet rule. Bryant McFadden discusses the QB situation in Buffalo and whether rookie Josh Allen should be the favorite to start Week 1. Senior NFL writer Pete Prisco discusses the Jags' offensive struggles during the preseason and whether it should be a cause for concern. Senior NFL writer Pete Prisco discusses whether he's sticking by his pick of the Jags winning the AFC this season. Senior NFL writer Pete Prisco discusses the Jaguars' defense heading into this season and whether they can duplicate their dominance from last year. Danny Kanell breaks down why he thinks Cousins will be fine this season for the Vikings. Danny Kanell breaks down why he thinks the Broncos have found a new backup QB. Danny Kanell breaks down why he thinks Watson proved he's on track as he makes his way back from a knee injury. Danny Kanell breaks down why Mahomes will be exciting to watch for the Chiefs this season. Danny Kanell breaks down who should come out on top for the Bills starting QB job. Jamey Eisenberg, Dave Richard and Heath Cummings discuss if T.Y. Hilton's stock is up or down after this weekend. Jamey Eisenberg, Dave Richard and Heath Cummings discuss if Kirk Cousins' stock is up or down after this weekend. Jamey Eisenberg, Dave Richard and Heath Cummings discuss if Ronald Jones' stock is up or down after this weekend. Jamey Eisenberg, Dave Richard and Heath Cummings discuss if Jordan Reed's stock is up or down after this weekend. Jamey Eisenberg, Dave Richard and Heath Cummings discuss if Carson Wentz's stock is up or down after this weekend. The Fantasy Football Today Crew answers your tweets! Is Bears TE Trey Burton's stock up or down after this weekend? Is Chargers WR Mike Williams's stock up or down after this weekend? Is Broncos RB Royce Freeman's stock up or down after this weekend? Is 49ers QB Jimmy Garoppolo's stock up or down after this weekend? Jamey Eisenberg, Dave Richard and Heath Cummings break down what can you expect to see from Christian Kirk on the Cardinals. Jamey Eisenberg, Dave Richard and Heath Cummings discuss their takeaways from the Browns/Bills game from last week. Senior fantasy expert Heath Cummings discusses if Carlos Hyde is a potential breakout star for Fantasy Football. Senior fantasy expert Heath Cummings discusses if Peyton Barber is a potential breakout star for Fantasy Football. Senior fantasy expert Heath Cummings discusses if Taywan Taylor is a potential breakout star for Fantasy Football. Danny Kanell discusses the Rams and Raiders sitting nearly 15 starters each in the preseason game. David Samson discusses Jose Urena throwing a complete game in start after hitting Ronald Acuna Jr.
David Samson discusses the Cardinals finding themselves right in the thick of things in the NL wild card race. David Samson discusses the impact for the Cubs if Yu Darvish misses more time. David Samson discusses the Rockies getting a big weekend sweep of the Braves. David Samson discusses the Astros taking the AL West lead back from Athletics. NFL writer Will Brinson breaks down what we should take away from Watson's performance against the 49ers. NFL writer Will Brinson breaks down just how significant Martin's injury is for the Cowboys. NFL writer Will Brinson discusses whether it's time to be concerned after two subpar performances by Keenum in the preseason. NFL writer Will Brinson discusses the QB-WR connection in San Francisco, breaks down where he ranks them among the elite duos in the NFL. Jason La Canfora discusses Dez Bryant meeting with the Browns and what are the chances a deal gets done. Jason La Canfora discusses the quarterback situation for the Jets and who is the favorite to start for the Jets in Week 1. Jason La Canfora discusses the injury concerns for the Eagles with Nick Foles getting injury against the Patriots. Vegas Insider Todd Fuhrman shares his Preseason Week 2 picks for Bills-Browns. Vegas Insider Todd Fuhrman shares his Preseason Week 2 picks for Chiefs-Falcons. Vegas Insider Todd Fuhrman shares his Preseason Week 2 picks for Cardinals-Saints. Jamey Eisenberg and Heath Cummings break down their 2-QB Mock Draft. Jamey Eisenberg and Heath Cummings discuss Carson Wentz being drafted in Round 4 of a 2-QB Draft. Jamey Eisenberg and Heath Cummings discuss what if Chris Carson looks like a star for the Seahawks. Jamey Eisenberg and Heath Cummings discuss what if Adam Shaheen outperforms Trey Burton again. Jamey Eisenberg and Heath Cummings discuss what if Ronald Jones struggles again. Jamey Eisenberg and Heath Cummings discuss what if Pierre Garcon looks better than Marquise Goodwin. Jamey Eisenberg and Heath Cummings discuss what if Michael Gallup has another big game. Jamey Eisenberg and Heath Cummings discuss what if Marshawn Lynch has another big game. Jamey Eisenberg and Heath Cummings discuss what if Adam Thielen is better than Stefon Diggs. Jamey Eisenberg and Heath Cummings discuss what if Josh Rosen is better than Sam Bradford. Jamey Eisenberg and Heath Cummings discuss what if Frank Gore is better than Kenyan Drake. Jamey Eisenberg and Heath Cummings discuss what if Patrick Mahomes struggles again for the Chiefs against the Falcons. Jamey Eisenberg and Heath Cummings discuss what if Kerryon Johnson looks like a star for the Lions. Jamey Eisenberg and Heath Cummings discuss what if Baker Mayfield looks better than Tyrod Taylor. Jamey Eisenberg and Heath Cummings discuss what can you expect to see from Jimmy Graham with the Packers. Injury concern over Jamaal Williams? Jamey Eisenberg and Heath Cummings discuss if owners should be concerned about Jamaal Williams' injury. Dr. Brandon Bowers breaks down the injury that is affecting Rex Burkhead and what are the Patriots going to do to minimize the chances he re-injuries the knee during the season. Dr. Brandon Bowers breaks down the injury to Jerick McKinnon and what are the chances he could potentially re-injuries his leg during the season. Jamey Eisenberg and Heath Cummings discuss the fantasy impact of the running backs for the 49ers and Patriots. Will Brinson discusses what the Eagles should do after Nick Foles injures his shoulder against the Patriots. Will Brinson discusses the comments made by Todd Bowels about the Jets' QB situation. Will Brinson discusses what you can expect to see from Patrick Mahomes in Preseason Week 2. Will Brinson discusses how will Nick Chubb and Kerryon Johnson impact the Browns and Lions. Can Cam Newton have success in Panthers offense? Will Brinson discusses if the Panthers o-line will give Cam Newton time to stretch the field. David Samson previews this weekend's matchup between the Astros and A's. David Samson discusses the Rangers pulling off a triple play in their win over the Angels last night. David Samson discuss if Edwin Diaz can make a case for himself to win the Cy Young award or MVP. David Samson discusses what the Dodgers can do to fix their bullpen. Heath Cummings describes his no-RB Fantasy Football draft strategy. Heath Cummings gives some top Fantasy RBs to take a chance on. David Samson discusses St. Louis playing well since Mike Shildt took over. David Samson shares his thoughts on Jose Urena hitting Ronald Acuna with a pitch last night. David Samson discusses what impact Freddie Freeman will have on the NL Playoff Race. NL Impact Players: Ronald Acuna Jr.
David Samson discusses what impact Ronald Acuna Jr. will have on the NL Playoff Race. David Samson discusses what impact Paul Goldschmidt will have on the NL Playoff Race. David Samson discusses what impact Nolan Arenado will have on the NL Playoff Race. David Samson discusses what impact Matt Carpenter will have on the NL Playoff Race. Will Brinson discusses Redskins being quiet on if Alex Smith will play against the Jets. Will Sam Darnold be the Jets starter? Will Brinson discusses who will be the Jets starting QB in Week 1. Will Brinson discusses Tom Brady will play tonight against the Eagles in Super Bowl rematch. Ryan Wilson discusses what should the Eagles do with Carson Wentz. Ryan Wilson discusses the comments made by Nick Foles and what are his takeaways from what Foles said. Ryan Wilson discusses Tom Brady and Bill Belichick being on the same page and they both just want to win. David Samson breaks down the records Ronald Acuna is setting and what does he think of the young Braves' star. David Samson breaks down why the Astros continue to struggle, especially at home. David Samson discusses Chris Archer really struggling with the Pirates. Who should start the Wild Card Game for the Yankees? David Samson discusses who should be the Yankees starter in a likely Wild Card Game. Raja Bell breaks down the high expectations for the Boston Celtics this season. Raja Bell breaks down D-Wade's decision to either return to the Heat or retire. Raja Bell discusses what Tony Parker will look like on the Hornets. Raja Bell breaks down Dirk Nowitzki's final season with the Mavs. Can Gordon Hayward make a full comeback? Raja Bell debates whether or not Gordon Hayward will be the same player he was before injury. How Should Eagles Handle Playing Carson Wentz Week 1? Bryant McFadden discusses the Eagles/Wentz situation as it pertains to him possibly starting Week 1.
Who's More Valuable To Their Team: Saquon Barkley Or Ezekiel Elliott? Bryant McFadden breaks down which player he thinks is more valuable to their team. Bryant McFadden breaks down the impact Smith's holdout had on the team before finally agreeing to a deal, joining camp. Inside Texans Training Camp: Is Deshaun Watson Fully Back? Evan Washburn breaks down Watson's progress as he tries to fully recover from a torn ACL. Evan Washburn discusses how Hopkins has looked so far during Training Camp. Inside Texans Training Camp: How Scary Is Defense When Healthy? Evan Washburn discusses just how good this Texans defense can be if they remain healthy. Evan Washburn joins to give an outlook on the Houston Texans. Evan Washburn joins to give an outlook on the Arizona Cardinals. Evan Washburn joins to give an outlook on the Jacksonville Jaguars. Evan Washburn joins to give an outlook on the Kansas City Chiefs. Bears beat writer Patrick Finley breaks down what he's seen from Trubisky during Training Camp thus far. Bears beat writer Patrick Finley discusses what are the expectations for Allen Robinson this season. Bears beat writer Patrick Finley breaks down what's next for the Bears after finally getting rookie Roquan Smith at training camp. When should A.J. Green be drafted? Jamey Eisenberg and Dave Richard discuss when you should draft A.J. Green in Fantasy Football drafts. When should Jordan Howard/Joe Mixon be drafted? Jamey Eisenberg and Dave Richard discuss when you should draft Jordan Howard or Joe Mixon in Fantasy Football drafts. When should Devonta Freeman/Christian McCaffrey/Jerick McKinnon be drafted? Jamey Eisenberg and Dave Richard discuss when you should draft Devonta Freeman, Christian McCaffrey or Jerick McKinnon in Fantasy Football drafts. Jamey Eisenberg and Dave Richard discuss what wide receivers you should draft in Fantasy Football drafts. When should Travis Kelce be drafted? Jamey Eisenberg and Dave Richard discuss when you should draft Travis Kelce in Fantasy Football drafts. When should Michael Thomas/Keenan Allen/Davante Adams be drafted? Jamey Eisenberg and Dave Richard discuss when you should draft Michael Thomas, Keenan Allen or Davante Adams in Fantasy Football drafts. Jamey Eisenberg and Dave Richard discuss what you can expect to see from the 49ers backfield this season. Saquon Barkley in bubble wrap? Jamey Eisenberg and Dave Richard discuss what the Giants should do with Saquon Barkley for the rest of preseason. Jamey Eisenberg and Dave Richard discuss what can you expect to see from the Packers offense this season. Jamey Eisenberg and Dave Richard discuss if you should draft Carson Wentz early or later in your draft and how do injuries to his wide receivers affect Wentz's fantasy potential for the season. Heath Cummings plays Fantasy Football Believe it or Not on the topic of Andrew Luck. Heath Cummings plays Fantasy Football Believe it or Not on the topic of Christian McCaffrey. Heath Cummings plays Fantasy Football Believe it or Not on the topic of Chris Carson. Heath Cummings plays Fantasy Football Believe it or Not on the topic of Royce Freeman. Heath Cummings plays Fantasy Football Believe it or Not on the topic of Michael Gallup. Jonah Keri and David Samson break down the historically good seasons Max Scherzer and Chris Sale are having. Jonah Keri and David Samson discuss who are the best left-handed pitchers of all-time. Jonah Keri and David Samson break down Robinson Cano's return from suspension and what do they expect to see from Cano tonight. Jonah Keri and David Samson discuss what Manny Machado has, or hasn't, brought to the Dodgers. Should deGrom be the NL Cy Young favorite? Jonah Keri and David Samson discuss if Jacob deGrom should win the Cy Young despite his low win total. Alex Smith discusses taking over in D.C.
Alex Smith talks to Jason La Canfora about his upcoming season with the Redskins. Will Roquan Smith be ready for the first game? Ryan Wilson discusses how will the holdout affect Roquan Smith heading into the season. Aaron Rodgers says criticism of young WRs "not personal"
Ryan Wilson discusses Aaron Rodgers' comments about the young WRs and was there a hidden message in the comments directed at the young wide receivers. Ryan Wilson discusses the injury updates for both Big Ben and AB and what is his level of concern with the injuries. Ryan Wilson discusses Lane Johnson continuing to talk trash to the Patriots after the Eagles beat them in the Super Bowl. Pete Prisco and Bryant McFadden join HQ and have more on the Jaguars suspending Jalen Ramsey and Dante Fowler. Pete Prisco and Bryant McFadden share their takes on the NFL's Rookie QBs after the first week of preseason. Jamey Eisenberg has more on the fantasy impact of Alshon Jeffrey possibly missing Week 1. The FFT crew answers your tweets! Jamey Eisenberg, Dave Richard and Pete Prisco discuss taking a look at the ADP for some key first rounders. Who is the 2nd best WR in football? Jamey Eisenberg, Dave Richard and Pete Prisco discuss what WR should owners select if Antonio Brown is off the board. Who are the top 4 players using ADP? Jamey Eisenberg, Dave Richard and Pete Prisco take a look at the ADP for the top 4 players . Who are players 5-8 using ADP? Jamey Eisenberg, Dave Richard and Pete Prisco taking a look at players 5-8 on draft boards using ADP. Jamey Eisenberg, Dave Richard and Pete Prisco discuss Vikings RB situation, Royce Freeman looking impressive and more takeaways from Vikings-Broncos game. Jamey Eisenberg, Dave Richard and Pete Prisco discuss if Philip Rivers is a trustworthy starter, David Johnson's return, and more takeaways from Cardinals-Chargers game. Jamey Eisenberg, Dave Richard and Pete Prisco discuss Kerryon Johnson's debut, Marshawn Lynch looking fresh and more takeaways from Lions-Raiders game. Jamey Eisenberg, Dave Richard and Pete Prisco discuss Matt Ryan's resurgence, the Jets QB situation and more takeaways from Falcons-Jets game. Should Baker Mayfield start Week 1? Jamey Eisenberg, Dave Richard and Pete Prisco discuss if Baker Mayfield should be the Browns QB1. Jamey Eisenberg, Dave Richard and Pete Prisco discuss Aaron Jones back at practice. Jamey Eisenberg, Dave Richard and Pete Prisco discuss 49ers Jerick McKinnon injury is just a muscle strain. Jamey Eisenberg, Dave Richard and Pete Prisco discuss Allen Robinson will play on Saturday. Jamey Eisenberg, Dave Richard and Pete Prisco discuss Nelson Agholor missing practice again today. Danny Kanell evaluates how Sam Darnold faired in his Jets debut. Danny Kanell evaluates how Josh Rosen faired in his Cardinals debut. Danny Kanell evaluates how Kirk Cousins and Case Keenum faired in their debuts with their new teams. Jason La Canfora joins HQ live from Jets camp to answer whether Sam Darnold will start Week 1. Jason La Canfora joins HQ live from Redskins camp to discuss injury replacements for Derrius Guice. Looking back at VJ Singh's win at the 2004 PGA Championship. Fantasy experts Dave Richard and Heath Cummings discuss Juju Smith-Schuster's performance against the Eagles. Fantasy experts Dave Richard and Heath Cummings discuss Joe Mixon's performance against the Bears. Is Jamaal Williams RB1 in Green Bay? Fantasy experts Dave Richard and Heath Cummings discuss if Jamaal Williams should be considered as a starting running back. Fantasy experts Dave Richard and Heath Cummings discuss how much does it matter that Dallas Goedert and Adam Shaheen had success last night. Will solid outing impact Michael Gallup's ADP? Fantasy experts Dave Richard and Heath Cummings discuss if Michael Gallup's ADP will go up after a solid night in Week 1 of preseason. Fantasy experts Dave Richard and Heath Cummings discuss a breakdown of the Patriots RB group from last night. Fantasy experts Dave Richard and Heath Cummings discuss Jerick McKinnon's performance against Cowboys. Fantasy experts Dave Richard and Heath Cummings discuss Sammy Watkins' performance against the Texans. Fantasy experts Jamey Eisenberg, Dave Richard and Heath Cummings discuss the performances of Tyrod Taylor and Baker Mayfield against the Giants. Fantasy experts Jamey Eisenberg, Dave Richard and Heath Cummings discuss David Njoku's performance against the Giants. Fantasy experts Jamey Eisenberg, Dave Richard and Heath Cummings discuss Saquon Barkley's performance against the Browns. Danny Kanell discusses his takeaways from Baker Mayfield's first taste of NFL action against the Giants. This week's StubHub Big Ticket Games of the Week are Nationals at Cubs and Mariners at Astros. Danny Kanell discusses Tom Brady sitting out the first preseason game against the Redskins. Who will the Bills play at QB? Danny Kanell discusses who will win the Bills QB battle. Danny Kanell discusses Andrew Luck throwing his first NFL pass since Week 17 of the 2016 season and how did he look against the Seahawks. Pete Prisco and Jamey Eisenberg join HQ from MetLife Stadium to discuss Dez Bryant's potential interest in the Cleveland Browns. NFL insider Jason La Canfora joins HQ to evaluate Andrew Luck's first action this preseason. Jason La Canfora joins HQ live from Baltimore with his impressions of Lamar Jackson in his second preseason game. Jason La Canfora joins HQ live from Baltimore to explain just how important this season is to Joe Flacco. Notes on Josh Allen's Bills debut against the Panthers in the NFL Preseason. Notes on NFL Preseason action from Deshaun Watson and Patrick Mahomes. Fantasy experts Dave Richard and Heath Cummings discuss what can you expect to see from Baker Mayfield and Saquon Barkley tonight. Fantasy experts Dave Richard and Heath Cummings discuss how much stock can owners put in Jared Goff and Cooper Kupp. Fantasy experts Dave Richard and Heath Cummings discuss the top WR storylines right now. Fantasy experts Dave Richard and Heath Cummings discuss Ronald Jones struggling in camp and if this will impact his fantasy value going forward. CBS Sports lead play-by-play announcer Jim Nantz discusses his love for Fantasy Football. CBS Sports lead play-by-play announcer Jim Nantz breaks down what you need to know about Bellerive Country Club. CBS Sports lead play-by-play announcer Jim Nantz breaks down what to expect from Dustin Johnson during the PGA Championship at Bellerive Country Club. CBS Sports lead play-by-play announcer Jim Nantz breaks down what to expect from Tiger Woods during the PGA Championship at Bellerive Country Club. CBS Sports lead play-by-play announcer Jim Nantz breaks down what to expect from Justin Thomas during the PGA Championship at Bellerive Country Club. CBS Sports college basketball writer Matt Norlander explains the new rules impacting college basketball. Will Brinson discusses what Andrew Luck needs to show in Thursday night's game against the Seahawks. Will Brinson discusses what can you expect to see from Ryan Tannehill this season. Will Brinson discusses the comments made by Aaron Rodgers about his young receiving core. Kyle Porter discusses Rory looking for major win No. 5 at Bellerive Country Club. Will Rickie Fowler get his first major? Kyle Porter discusses whether Rickie Fowler will finally get his first major at Bellerive Country Club. Tiger Woods highlights Kyle Porter's 9 guys to root for in the PGA Championship. Raja Bell breaks down the reported Christmas Day matchup between the Lakers and Warriors. Raja Bell breaks down the reported Christmas Day matchup between the Bucks and Knicks. Raja Bell breaks down the reported Christmas Day matchup between the Sixers and Celtics. Raja Bell gives his dream Christmas Day matchups. Danny Kanell discusses if Andy Reed's decision to play Patrick Mahomes will pay off. Danny Kanell discusses what can you expect to see from Alex Smith and the Redskins this season. Mistake not playing Dak vs 49ers? Danny Kanell discusses whether Dak Prescott does need to play in the first preseason game against the 49ers. Danny Kanell discusses if the Browns will get a good look at Baker Mayfield during first preseason game. Jamey Eisenberg. Dave Richard and Heath Cummings discusses what kind of fantasy impact can you expect to see from Chris Godwin this season. Jamey Eisenberg. Dave Richard and Heath Cummings discusses Jordan Howard is "catching 200-300 extra balls a day". Jamey Eisenberg. Dave Richard and Heath Cummings discusses the Bills not rushing Josh Allen and can you trust any quarterback or wide receiver for the Bills. Jamey Eisenberg. Dave Richard and Heath Cummings discusses Dak Prescott struggling to get ball downfield and what can you expect from Prescott this season. Jamey Eisenberg. Dave Richard and Heath Cummings discusses what can you expect from Andrew Luck this season. Jamey Eisenberg. Dave Richard and Heath Cummings discusses Carson Wentz has yet to be cleared for contact and what can you expect from Wentz this season. Jamey Eisenberg. Dave Richard and Heath Cummings discusses what you can expect from Deshaun Watson this season coming off an ACL tear. Jamey Eisenberg. Dave Richard and Heath Cummings discusses if will we see Jets rookie QB Sam Darnold in Week 1. Fantasy Football expert Jamey Eisenberg breaks down which Rams WR has the most upside this season. Jamey Eisenberg. Dave Richard and Heath Cummings discusses what kind of fantasy impact can you expect to see from Jordan Reed this season. Jamey Eisenberg. Dave Richard and Heath Cummings discusses what kind of fantasy impact can you expect from Zach Ertz this season. Jamey Eisenberg. Dave Richard and Heath Cummings discusses Free agent WR Dez Bryant reportedly not interested in Browns and where could they see Bryant drafted. Evan Washburn joins Jamey Eisenberg, Dave Richard and Heath Cummings to discuss what he expects to see at Browns Camp. Evan Washburn joins Jamey Eisenberg, Dave Richard and Heath Cummings to give an outlook on the Pittsburgh Steelers for the season. Evan Washburn joins Jamey Eisenberg, Dave Richard and Heath Cummings to give an outlook on the Baltimore Ravens for the season. Evan Washburn joins Jamey Eisenberg, Dave Richard and Heath Cummings to give an outlook on the Philadelphia Eagles for the season. Evan Washburn joins Jamey Eisenberg, Dave Richard and Heath Cummings to give an outlook on the New England Patriots for the season. Evan Washburn joins Jamey Eisenberg, Dave Richard and Heath Cummings to give an outlook on the Buffalo Bills for the season. Ryan Wilson discusses the latest news on Aaron Donald's holdout. Will OBJ get a new deal? Ryan Wilson breaks down the chances Odell Beckham gets a new deal from the Giants. Ryan Wilson discusses the chances Seahawks give Earl Thomas a new deal. Ryan Wilson discusses if the rookie wage scale is hurting Khalil Mack. Jamey Eisenberg, Dave Richard and Pete Prisco break down what kind of fantasy impact can you expect to see from Keenan Allen and Davante Adams in fantasy this season. Jamey Eisenberg, Dave Richard and Pete Prisco break down what kind of fantasy impact can you expect to see from Doug Baldwin and Amari Cooper this season. Jamey Eisenberg, Dave Richard and Pete Prisco break down what kind of fantasy impact can you expect to see from Michael Crabtree and Chris Hogan this season. Jamey Eisenberg, Dave Richard and Pete Prisco break down what kind of fantasy impact can you expect to see from Jordy Nelson and Robby Anderson this season. Jamey Eisenberg, Dave Richard and Pete Prisco break down what kind of fantasy impact can you expect to see from Jamison Crowder and DJ Moore this season. Jamey Eisenberg, Dave Richard and Pete Prisco answer your Twitter questions. Jamey Eisenberg, Dave Richard and Pete Prisco break down the fantasy impact of some key players for the Falcons and discuss what Pete saw from the team when he visited their training camp. Jamey Eisenberg, Dave Richard and Pete Prisco break down the outlook for Dalvin Cook in 2018 and discuss who is a better wide receiver Adam Thielen or Stefon Diggs. Jamey Eisenberg, Dave Richard and Pete Prisco break down the outlook for Aaron Rodgers in 2018 and what are the Packers going to do in the backfield. Jamey Eisenberg, Dave Richard and Pete Prisco breaks down the wide receivers for the Rams and what can you expect from them in fantasy. Jamey Eisenberg, Dave Richard and Pete Prisco break down what kind of impact Mike Williams and Austin Ekeler can have on the Chargers. Jamey Eisenberg, Dave Richard and Pete Prisco breaks down where to draft Cobb for your fantasy team and what is the impact of the injury on Cobb. Jamey Eisenberg, Dave Richard and Pete Prisco break down what they expect from Gordon in fantasy and his actual impact on the Browns this season. Jamey Eisenberg, Dave Richard and Pete Prisco discusses the chances Marlon Mark reaches 1,500 yards on the season. Kenyan Drake and Frank Gore, co-starters in Miami? Jamey Eisenberg, Dave Richard and Pete Prisco breaks down how Miami is going to use both running backs and could this hurt Drake's fantasy impact with him sharing carries with Gore. What can we expect from Eric Decker with the Patriots? Jamey Eisenberg, Dave Richard and Pete Prisco break down the value of Decker in fantasy and what kind of production can we expect from Decker this season. Jamey Eisenberg, Dave Richard and Pete Prisco break down the value of Amendola in fantasy and what kind of production can we expect from Amendola this season. Jamey Eisenberg, Dave Richard and Pete Prisco breaks down the fantasy impact and the actual impact Coleman can have in Buffalo. Jamey Eisenberg, Dave Richard and Pete Prisco breaks down what is the impact of the injury on Michel and does it affect his fantasy and production on the field this season. Danny Kanell breaks down how losing 12 lbs could change Leonard Fournette's game. Danny Kanell breaks down what to expect from Dalvin Cook this season. Will David Johnson be ready to go? Danny Kanell breaks down the concern level for David Johnson in 2018. Danny Kanell breaks down how the Giants should manage Saquon Barkley's workload. Raja Bell breaks down if he agrees with the Westgate SuperBook about the projections for the Lakers this season. Raja Bell breaks down if he agrees with the Westgate SuperBook about the projections for the Rockets this season. Raja Bell breaks down if he agrees with the Westgate SuperBook about the projections for the Raptors this season. Evan Washburn tells us how the Eagles are approaching this season after their Super Bowl win. Why didn't Mitchell Trubisky play a snap? Bears beat writer Patrick Finley tells us why Mitchell Trubisky didn't play in the Hall of Fame Game. Will Roquan Smith suit up Week One? Bears beat writer Patrick Finley has the latest on Roquan Smith. Bears beat writer Patrick Finley tells us what Allen Robinson and Mitchell Trubisky can do together this season. Jamey Eisenberg tells us who could be this year's Todd Gurley in your fantasy draft. Jamey Eisenberg tells us what fantasy impact Alvin Kamara could have this season. Fantasy Football Running Back Rankings: Dalvin Cook a risk? Jamey Eisenberg shares if Dalvin Cook is a risky draft choice coming off his ACL injury this season. Jamey Eisenberg shares which running backs to take at the top of your drafts. Jason La Canfora goes one-on-one with both Franck Reich and T.Y. Hilton to get the latest update on Andrew Luck. Ryan Wilson discusses how the new helmet rule was enforced in the Hall of Fame Game and what are his takeaways about the rule being used for the first time. Ryan Wilson discusses Lamar Jackson's performance in the Hall of Fame Game against the Bears. Ryan Wilson discusses what does the future look like for Mitch Trubisky. Ryan Wilson discusses his takeaways from Robert Griffin III's performance in the Hall of Fame Game against the Bears. Jonah Keri discusses the Dodgers hosting the Astros in a World Series rematch this weekend. Jonah Keri discusses how the Red Sox are starting to pull away from Yankees in AL East race. Jonah Keri discusses how the Nationals have kept within striking distance in NL East. Should Alabama be No. 1 in Coaches Poll? Barrett Sallee discusses why Alabama is ranked No. 1 in Preseason Coaches Poll. Is Georgia building a juggernaut? Barrett Sallee discusses if Kirby Smart is turning Georgia into a juggernaut. Takeaways from Lamar Jackson's preseason debut for the Baltimore Ravens. Takeaways from Hayden Hurst's preseason debut for the Baltimore Ravens. Pete Prisco has the latest on Roquan Smith's contract situation with the Chicago Bears. Breaking down the NFL's new crown of helmet rule in comparison to college football's targeting penalty. Philip Rivers joins Pete Prisco at training camp to discuss the Chargers' second season in Los Angeles, his intensity on the football field, and more. Evan Washburn has a report on Tom Brady from Patriots Camp. Evan Washburn discusses who is the new Patriots defensive play caller Brian Flores. Ryan Wilson discusses what can we expect from Mitch Trubisky in year two with the Bears. Ryan Wilson discusses what can we expect from Lamar Jackson in his first season with the Ravens. Ryan Wilson discusses Roquan Smith will not play in Hall of Fame Game against the Ravens. Ryan Wilson discusses if Joe Flacco can hold on to his starting job with the Ravens. Jonah Keri discusses the Athletics moving into tie with Mariners for second wild card spot. Jonah Keri discusses who is the favorite in the NL wild card race. Is Khris Davis an MVP dark horse? Jonah Keri discusses if Khris Davis may be an MVP contender this season. Are the Mariners cooling off? Jonah Keri discusses if the Mariners are starting to feel the pressure and is he concern with Seattle going forward. Kyle Porter discusses Tiger Woods and Phil Mickelson will go head-to-head in November in Las Vegas. Is Dustin Johnson primed to make a run? Kyle Porter discusses if Dustin Johnson is on the verge of making a run. Will Urban Meyer coach this season? On CBS Sports HQ, 247Sports Director of Scouting Barton Simmons joins Nick Kostos to discuss why he believes Urban Meyer may still end up coaching at Ohio State this season. Will Brinson breaks down Jalen Ramsey going head-to-head with Odell Beckham as the Jags and Giants face off in Week 1. Will Brinson breaks down Marshon Lattimore going head-to-head with Mike Evans as the Saints and Bucs face off in Week 1. Will Brinson breaks down Jimmy Garoppolo facing a tough test vs Vikings defense in Week 1. Will Brinson breaks down JJ Watt going against Tom Brady as the Texans and Patriots battle in Week 1. How much did Brewers improve? Jonah Keri discusses how much did the trade deadline improve the Brewers. How is Brian Dozier going to help the Dodgers? Jonah Keri discusses what kind of impact Brian Dozier will have on the Dodgers. Jonah Keri discusses the Mets keeping team intact for next season, but get blown out 25-4 by the Nationals. Jonah Keri discusses what kind of impact Chris Archer will have on the Pirates. Who is the best player in the country? Dennis Dodd discusses who is the best player in the country? Dennis Dodd discusses how much pressure is on Washington and the Pac-12. Dennis Dodd discusses expectations for UCLA this season and who is UCLA's Caleb Wilson. What does the Pac-12 need to do to get respect? Dennis Dodd discusses what does the Pac-12 need to do this season to garner respect. Dennis Dodd discusses the new coaches in the Pac-12 this season. Raja Bell discusses what will Team USA look like in the Tokyo 2020 Olympics. Is Team USA still significantly better than the rest of the world? Raja Bell discusses how big the gap is between Team USA Basketball and the rest of the world. Raja Bell discusses who are the new stars that could be leading Team USA in the Tokyo 2020 Olympics. Bryant McFadden discusses the NFL's new helmet rule, which makes it illegal for players to initiate contact with their helmets. Bryant McFadden breaks down how the Raiders plan to improve their lowly defense from a season ago. Jason La Canfora discusses the Bills' QB competition, breaks down who he believes will win the job. Jason La Canfora discusses the move by the Vikings to sign Diggs to a 5-year extension. Jason La Canfora breaks down what the realistic expectations for Andrew Luck are this season. Evan Washburn breaks down the realistic expectations for rookie QB Josh Allen this season in Buffalo. Inside Bills Training Camp: What Is This Team's Strength? Evan Washburn breaks down the strengths of the 2018 Bills. Evan Washburn discusses how different this Bills roster is than the one that made the playoffs last season. Dennis Dodd and Barrett Sallee break down the Week 1 matchups they're most excited for. Dennis Dodd and Barrett Sallee discuss the early Heisman odds for this upcoming season. Dennis Dodd and Barrett Sallee break down which college football head coach is most set up to fail this season. Dennis Dodd and Barrett Sallee break down which college football coach is most set up to succeed this season. 2018 MLB Trade Deadline: Do Red Sox Need To Make A Move? Jonah Keri breaks down whether he thinks the MLB-best Red Sox need to make a deal at the deadline. Jonah Keri discusses some of the trades he anticipates will go down before the trade deadline. 2018 MLB Trade Deadline: Which AL Team Needs To Make A Move? Jonah Keri breaks down which AL team he believes needs to make a move before the trade deadline. 2018 MLB Trade Deadline: Was Bryce Harper Ever On The Block? Jonah Keri breaks down the chances that the Nationals move former MVP Bryce Harper. Jonah Keri discusses which players should be moved but probably won't have a new team once the deadline passes. Jonah Keri breaks down which contending NL team should make a move before the trade deadline. Ryan Wilson discusses the comments made by Jon Gruden about Oakland's defense. Ryan Wilson breaks down why Josh McCown is still QB1 for the Jets. Ryan Wilson discusses the Patriots trying to improve on the defensive side of the ball. Barton Simmons and Chip Patterson discuss if Clemson could have a QB battle between Kelly Bryant and Trevor Lawrence. Barton Simmons and Chip Patterson discusses the expectations for what Alabama will do at QB. Barton Simmons and Chip Patterson breaks down Georgia improving to No. 2 in 2019 Recruiting Rankings and what does this mean going forward for Georgia. Jamey Eisenberg breaks down the running backs ranked from 31 to 40. Jamey Eisenberg breaks down Marshawn Lynch's fantasy potential. Jamey Eisenberg breaks down Rex Burkhead's fantasy potential. Jamey Eisenberg breaks down Tevin Coleman's fantasy potential. Jim Bowden joins HQ on whether the Nationals will buy, sell or even consider trading Bryce Harper. Jim Bowden joins HQ to explain the decision making by the Astros bringing in Roberto Osuna. Jim Bowden joins HQ to talk about the impact of the Red Sox acquiring infielder Ian Kinsler from the Angels. Jim Bowden joins HQ to discuss what kind of player the Braves are getting in Adam Duvall. Jim Bowden joins HQ to break down the Yankees starting pitching staff after the acquisition of Lance Lynn. Jamey Eisenberg breaks down the running backs ranked from 41 to 50. Jason La Canfora breaks down what is the relationship like between Tyrod Taylor and Baker Mayfield. Jason La Canfora discusses what to expect from Hue Jackson this season with the Browns. Jason La Canfora discusses the Browns' offseason moves coming together at camp. Live from Browns Camp: Could Dez be added? Jason La Canfora discusses the chances the Browns could add Dez Bryant. Evan Washburn discusses Le'Veon Bell's morale early in Steelers camp. Evan Washburn discusses the relationship between Big Ben and Mason Rudolph. Evan Washburn discusses some of the notable injuries the Steelers are dealing with at camp. What will Packers offense look like? Bryant McFadden discusses what should fans expect from the Packers offense this season. Bryant McFadden breaks down Aaron Rodgers' relationship with the Packers and what are the expectations of Green Bay heading into the season. Bryant McFadden discusses the latest on Aaron Donald and his desired contract. Thomas Rongen discusses how important Wayne Rooney and Zlatan Ibrahimovic are for the MLS. Who is the best player in the MLS? Thomas Rongen discusses who is the best player in the MLS right now. Juan Carlos Osorio to USMNT? Thomas Rongen discusses if Juan Carlos Osorio could join USMNT. MLB Trade Deadline: Will Yankees or Red Sox make a move? Jonah Keri discusses if the Yankees or the Red Sox will make a trade before the trade deadline. Jonah Keri discusses what team he thinks need to make moves before the trade deadline. Jamey Eisenberg breaks down the fantasy potential of the Packers backfield. Jamey Eisenberg breaks down the fantasy potential of the Browns backfield. Jamey Eisenberg breaks down Matt Breida's fantasy potential. Jamey Eisenberg breaks down Chris Carson's fantasy potential. Kyle Porter discusses what should we expect from Tiger Woods at Firestone. Kyle Porter discusses the favorites for next week's PGA Championship. Kyle Porter discusses how Dustin Johnson earned his 19th career tour victory at the RBC Canadian Open. Will Brinson discusses the ongoing situation with the Raiders and Khalil Mack. Will Brinson discusses the ongoing situation with the Jets and Sam Darnold. Will Brinson discusses Antonio Brown trying to recruit Dez Bryant to Pittsburgh. Who will be the QB in Arizona? Will Brinson discusses the Cardinals' QB battle between Sam Bradford and Josh Rosen. Will Carmelo Anthony Start For The Rockets? How Much Better Does Mike Moustakas Make The Brewers? 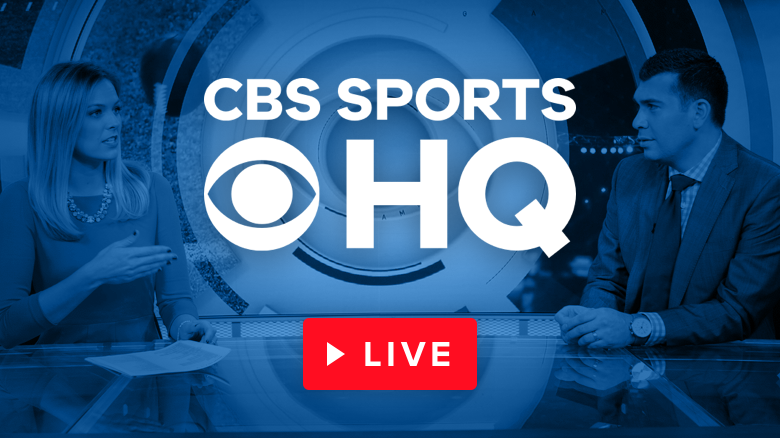 On CBS Sports HQ, Hakeem Dermish discusses the breaking news that Royals' Mike Moustakas is heading to Milwaukee in exchange for two prospects. Pete Prisco joins HQ from Falcons training camp and looks at Julio Jones' newly restructured deal. Leger Douzable joins HQ to break down Taylor Lewan's record-setting deal with the Titans. Leger Douzable joins HQ with more on Jason Verrett tearing his Achilles on Friday. Pete Prisco joins HQ to look at Jake Matthews' 5-year, $75 million contract extension. Do Dodgers Need Kershaw's Best to Win? Chris Sale Best Pitcher in Baseball? CBS Sports college football writer Barrett Sallee breaks down the over-under win total for Alabama. CBS Sports college football writer Barrett Sallee breaks down the over-under win total for Florida. CBS Sports college football writer Barrett Sallee breaks down the over-under win total for Georgia. CBS Sports college football writer Barrett Sallee breaks down the over-under win total for LSU. CBS Sports college football writer Barrett Sallee breaks down the over-under win total for Texas A&M. Pete Prisco is live from Falcons Camp and discusses Julio Jones. Fantasy Football: Can they do it again? Dave Richard breaks down if breakout players from last year can find the same success. Pete Prisco talks with Falcons QB and former NFL MVP Matt Ryan. Matt Ryan looking to have bounce back from down year last season. Evaluating the Falcons' improved defense. Taylor Lewan becomes highest-paid offensive lineman in football. Paul George gets candid about staying with OKC. Clint Capela is still waiting on a big offer. Carmelo Anthony is not willing to come off the bench for the Rockets. Is this series in Miami a must-win for the Nationals? Brewers could land Matt Harvey. Jarvis Landry thinks the Browns will be very good this season. When will Odell get a deal? Giants GM says OBJ will get a deal "sooner rather than later". Cam Newton is enjoying himself at Panthers Camp. Buccaneers won't commit to Jameis Winston. Arizona State head coach Herm Edwards sits down with Dennis Dodd. Jamey Eisenberg goes through the No. 6-10 best QBs in the NFL. What should we expect from Tom Brady as he enters season 19? Rob Gronkowski returns to the Patriots after hectic offseason. Patriots begin training camp Thursday morning. Albert Pujols hits home run No. 631, passes Ken Griffey Jr. for 6th all-time. Red Sox bolster staff by adding Nathan Eovaldi. Pirates 11-game win steak comes to an end in Cleveland. J.J. Watt, Deshaun Watson cleared to practice, according to Texans GM. Carson Wentz will not start Eagles camp on PUP list. Julio Jones will report to Falcons training camp. Andrew Luck will play for Colts in preseason opener. Browns GM John Dorsey says team has talked about adding Dez Bryant. How Versatile Can Raptors Be This Season? Should Aaron Donald Be Concerned Over Rams' Spending? How Will Earl Thomas' Holdout Play Out? Danny Green played with groin tear that was undetected by Spurs medical staff last season. How will Red Sox, Astros react to Zach Britton trade? How will the Red Sox and Astros react to the Zach Britton to the Yankees trade? Padres looking to make a splash and land Noah Snydergaard, Chris Archer. Yoenis Cespedes headed to DL, what this means for the Mets. Jamey Eisenberg goes through the No. 11-15 best QBs in the NFL. Sam Darnold has yet to sign his rookie deal with the Jets. Baker Mayfield signs rookie deal with Browns. Kansas City Star reporter Blair Kerkhoff breaks down what the expectations for Mahomes are this season. Kevin Durant turned down the chance to join LeBron in L.A.
On CBS Sports HQ, national columnist and host Bill Reiter joins Chris Hassel to discuss the report that K.D. turned down joining LeBron with the Lakers. 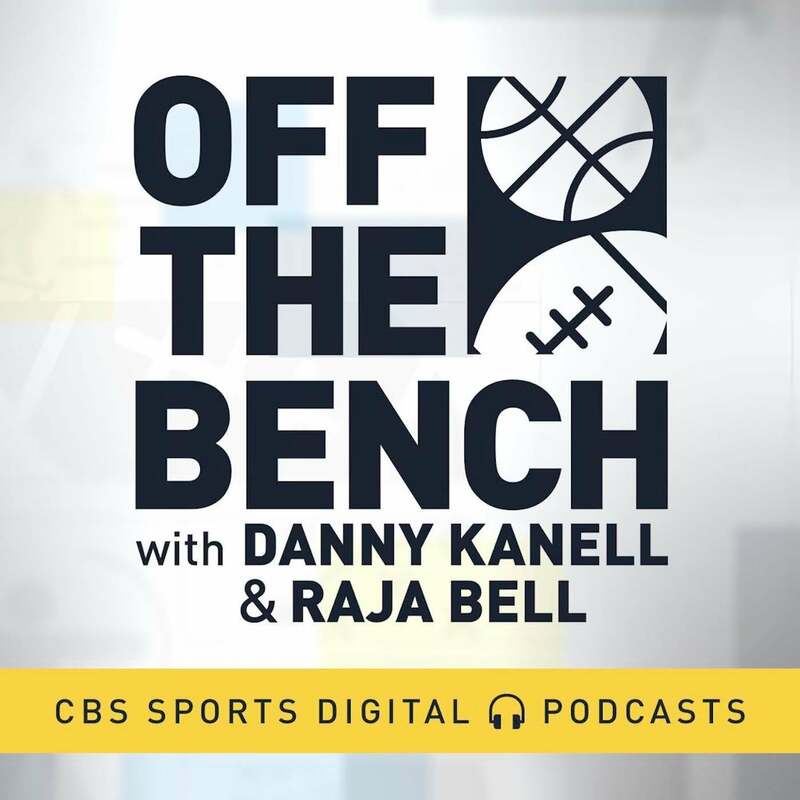 Breaking down Paul George's decision to pick OKC over L.A.
On CBS Sports HQ, national columnist and host Bill Reiter joins Chris Hassel to break down PG-13's decision to stay with the Thunder over going to the Lakers. On CBS Sports HQ, NBA writer Reid Forgrave joins Chris Hassel to help add more perspective to the Cousins-Warriors union. On CBS Sports HQ, NBA writer Reid Forgrave joins Chris Hassel to make sense of the moves the Lakers made after landing LeBron. On CBS Sports HQ, football analyst Danny Kanell joins Dalen Cuff to go over his top Heisman trophy candidates. On CBS Sports HQ, college sports writer Chip Patterson joins Chris Hassel to break down where Oklahoma ranks among the best in college sports. On CBS Sports HQ, college sports writer Chip Patterson joins Chris Hassel to break down where Alabama ranks among the best in college sports. On CBS Sports HQ, college sports writer Chip Patterson joins Chris Hassel to break down where Ohio State ranks among the best in college sports. On Smarter In 60, Chris Hassel breaks down the numbers on Davis' struggles this season for the Orioles. Having problems with video? Click here. © 2005-2016 CBS INTERACTIVE. ALL RIGHTS RESERVED. CBS Sports is a registered trademark of CBS Broadcasting Inc. Commissioner.com is a registered service mark of CBS Interactice, Inc.